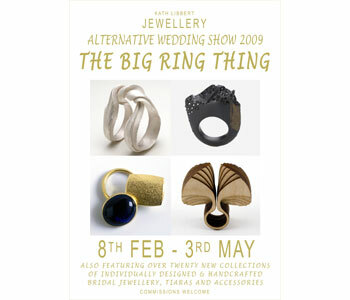 Brides-to-be who are looking to make a big statement on their big day need look no further for their jewellery than Kath Libbert Jewellery Gallery’s 8th Alternative Wedding and Valentine Show taking place from 8th February to 3rd May 2009. Alongside over 20 new collections of stylish, contemporary jewellery and accessories, The Big Ring Thing showcases amazing rings from 4 leading designers, guaranteed attention grabbers - these are perfect rings for big personalities! The only contemporary jeweller working with Whitby jet, Jacqueline Cullen carves this ancient material into dramatic rings with black diamonds and Swarovski crystals set in the natural fissures. By incorporating the jet’s inherent flaws into her designs, Jacqueline celebrates the natural beauty of this intriguing material. Her jewellery will be seen on the big screen in 2009, worn by the evil character Narcissa in Harry Potter and the Half Blood Prince. Twisting and stretching an elastic band around his fingers inspired Michael Carberry to create his ‘Mobius Rings’, a sensual series of rings, each created from a continuous band of fine silver, either wrapped as one piece or broken, wrapped and overlapped. These are rings which flow beautifully - both around themselves and the finger of the wearer. Her fascination with precious metals and a reputation for using traditional goldsmithing skills in unorthodox ways are both evident in Jacqueline Mina’s sumptuous large-scale kinetic rings crafted from outsize gems such as vintage catseye sapphires combined with gold and platinum. Winner of the prestigious Jerwood Prize for Applied Art in 2000, Jacqueline has work in major public collections including the V&A Museum. And if precious gems aren’t your thing – then how about plywood? Constructed from curving layers of plywood, symbolic of the coastlines that inspire them, Anthony Roussel’s rings are big and bold - yet gentle. They would also make a fantastic 5th anniversary present – which tradition deems should be made of wood! original yet eminently wearable necklaces and rings. The exhibition’s Mainly Men showcase features a new collection of chunky, chiselled rings and bangles in gold and silver by long-time Gallery favourite Malcolm Morris - designer to stars such as Gwyneth Paltrow and Dawn French - alongside ‘tyre-tread’ patterned rings and cufflinks in heavily oxidized silver by renowned Birmingham jeweller James Newman, who is originally from Barnsley. These are just some of the highlights from the Show’s great selection of unique jewels for men, which includes an extensive choice of cufflinks, some of which are one-offs specially commissioned for the Gallery. ‘The Alternative Wedding Show’ runs from 8th February to 3rd May 2009 at Kath Libbert Jewellery Gallery, Salts Mill, Saltaire, West Yorkshire. Salts Mill is open weekdays from 10am – 5.30pm and weekends 10am – 6pm. For further information call 01274 599790. Artists featured in 'Alternative Wedding Show 2009' are: Disa Allsopp; Jo Hayes Ward; Jed Green; Kate Moncrieff; Inga Reed; Malcolm Morris; Angela Fung; Marianne Anderson; Mikala Djorup; Nicola Perkins; Shimara Carlow; Mirri Damer; Stephanie Moog; James Newman; Diana Porter; Sarah Lawrence; Sarah Collins; Shona Carnegie; Poppy Dandiya; Catherine Mannheim;Bex Bardon; Sarah Herriot; Squarecircles. Artists featured in 'The Big Ring Thing' are: Jacqueline Mina; Anthony Roussel; Jacqueline Cullen; Michael Carberry.